Are the fundamentals of our every day work to pursue every goal. Choosing OFFICINA GRAZIOSI GRAZIOSI as your manufacturer means both getting the final product starting from the initial workpiece, and relying on all the experience we have been collecting throughout over 60 years of work on bar stocks forged and castings. Our constant diligence has led OFFICINA GRAZIOSI to invest in advanced machinery, in education and refresher courses for all of its workers and top quality materials. 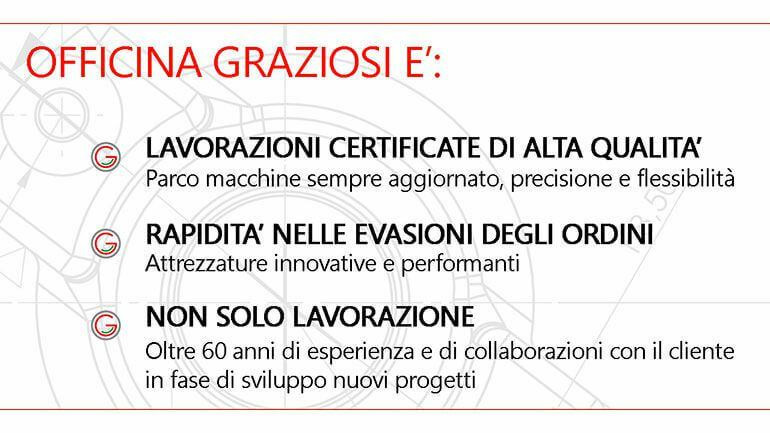 By choosing the best machine tool suppliers of the world, OFFICINA GRAZIOSI has always had an up-to date workshop, capable of easily satisfy the various requests of our both national and international customers. OFFICINA GRAZIOSI is able to deliver small and medium batches of the final product.